Update: Phooky merged this improvement into the official branch, thanks!! The stl preview pane seems to be fixed at 10cm x 10cm x 10cm. This may not correspond to the build volume of the machine the user has selected, e.g. 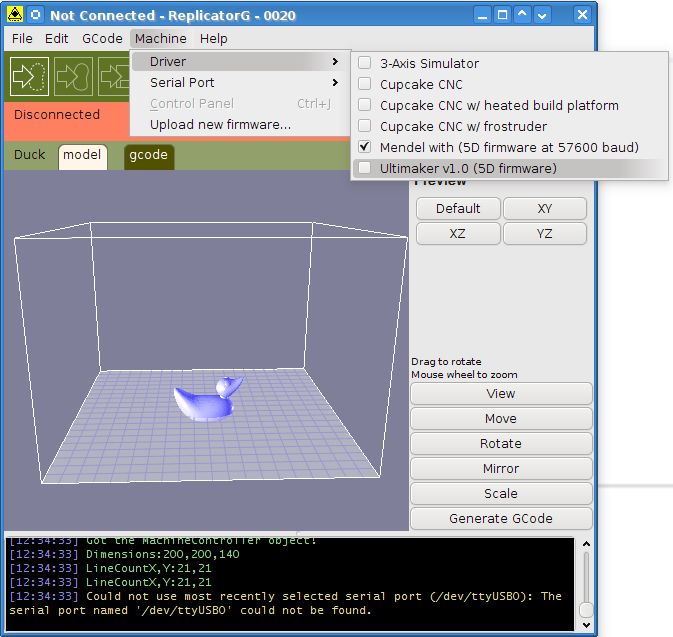 reprap mendel using makerbot firmware, or self-built or prototype makerbots with non-standard dimensions. It would make sense to obtain these dimensions from entries in the machines.xml (I am guessing that a new axis attribute would be needed, as the definition of the existing length attribute sounds like it may not correspond to the actual buildable length on that axis). For RepRaps and Ultimakers a 10x10x10 build volume in the preview isn’t the right size (Mendel’s is about 20x20x14 and the Ultimaker is closer to 21x21x21). Not knowing Java very well it took me half a day, but I fixed it! It was fairly complicated to get this working, because the machine was initialized after the preview panel. Now the preview panel has a refresh feature which is called upon the loading of a machine and is fed the BuildVolumes objects. The BuildVolumes object currently contains a very simple model of the machine’s volume (a 3D block), but there’s room for adding cutouts and keep-out zones (e.g. nozzle cleaning brushes) that can also be displayed. With multiple printheads, while your axes can still move a long length, the build volume that both can reach becomes smaller. So in the future the axes lengths are overridden by a BuildVolume element in the XML config. This is the commit and here is a linux and a windows release. Mind: it’s not really ReplicatorG-0021 as the filename suggests, and it doesn’t contain a skeinforge profile for 5D printing (yet). If someone can send in a good Vanilla Skeinforge profile for the Mendel (5D), I can include that in subsequent releases. Note: When trying this, make sure to overwrite or update your machines.xml (in ~/.replicatorg/ or Documents and settings\[username]\.replicatorg\)! Next story FSCONS 2010 & Graduation & Ultimaker! why don’t you post-process the skeinforge output with your http://reprap.org/wiki/3D-to-5D-Gcode.php script for the Mendel? Ik wil voor een verrijkingstraject voor school (VWO 3) een 3D printer gaan bouwen. Weet je of dit al eerder is gedaan? En kun je me tips geven hoe ik dit aan moet pakken? Geld is een groot probleem. Alvast bedankt voor je hulp! Works on Ubuntu 10.10 with custom profile. Thanks for the great work.